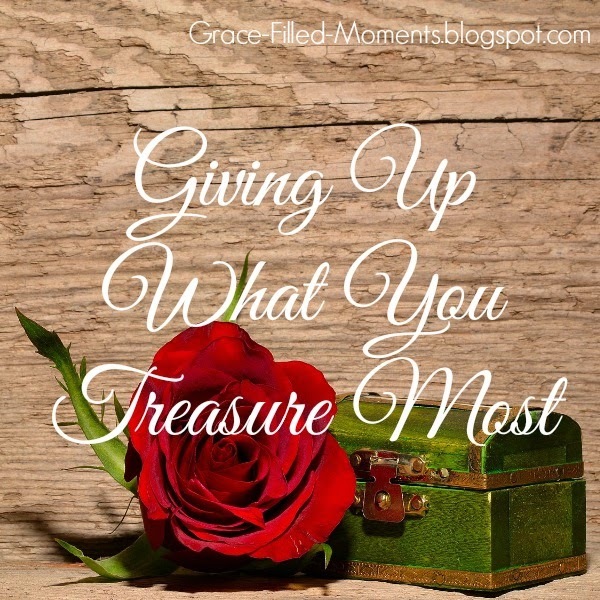 Have you ever thought about giving up what you treasure most? I'm sure this is not something most of us think about on a daily basis - I'll admit I certainly don't. But my reading today in Exodus 38 has brought this question to the forefront of my mind and that's what I'd like to talk about today in this Blogging Through the Bible post. Isn't it amazing what you can find tucked away in God's Word?! Repetition of building supplies and measurements have made for some difficult days of reading, right? But this little nugget found in verse 8 is why we must not give up when it comes to reading difficult books in the Old Testament such as Exodus. Look at this opportunity for spiritual growth we would have missed! Serving women who assembled at the door of the tabernacle of meeting...giving up what they treasured most. Has there been a time in your life of giving up what you treasure most so that it could be used by God? These women willingly gave from their possessions that God had blessed them with during their deliverance from Egypt. Check out my Women of the Bible series post, T is for Tabernacle Women, to find out more about these special women and what we can learn from their lives. Observations: In chapter 37, Bezalel carefully works to make the ark of the testimony, the table for the showbread, the golden lampstand, the altar of incense, the anointing oil and the incense according to the Word of God as spoken to Moses. Application: When God gives us instructions, we must be careful to follow His direction. Kneel: Heavenly Father, thank You for the gift of Your Word that we have in our Bibles. Help us to take the time necessary to be in the Word, to soak in the instructions and directions You give us for how to live our lives so that we can shine our lights for all to see. Father, I want to glorify You through the life I live. I want to be a living testimony of Your goodness and Your faithfulness. The only way I can do that is by spending time with You in Your Word so that I will know the truth and be set free from all the lies of this fallen world. I pray for a hunger and a thirst for Your Word that will keep me in my Bible. Thank You for meeting me each time I read and for showing me Your truth. It’s with a grateful heart I pray in the name of Jesus. Amen! Observations: Moses mentions specifically “the women who assembled at the door of the tabernacle of meeting” here. I love this verse! We don’t know anything else about these women – not even their names – but what has been recorded about their lives is the fact that they served at the door of the tabernacle of meeting and that they gave up their most treasured items as an offering for the fashioning of the laver and its base. Bezalel fashioned the laver and its base out of the bronze from the mirrors that these faithful women willingly gave. Interestingly, mirrored glass was unknown in ancient times – these mirrors were totally bronze, giving an adequate though imperfect reflection. Application: Am I willing to surrender my most prized treasures for the service of the Lord? What would that look like for women in today’s modern world? Giving up going out to eat so often so that the money saved can be used for missions work is an idea that comes to mind. How about donating to the local battered women’s shelter if my closet is cram-packed with shoes? What about using my time more wisely so that I can mentor that younger woman in my church who is struggling in her marriage? What will I be remembered for when my life here is over? I hope I’m remembered as a woman who loved God with all her heart, who couldn’t get enough of His Word, was a prayer warrior, and loved her family and friends well. Kneel: Heavenly Father, I thank You for special messages that are tucked deep within chapters that unfortunately at times we are quick to skim over. I thank You for Good Morning Girls and for this Reading through the Bible journey that we are on together. Father, I pray that I would freely offer up to You anything that You’ve blessed me with – even my most treasured possessions – for the building of Your kingdom and to encourage and equip other women in their walk with You. May I live my life in complete surrender to You and always walk in the grace provided by Your mighty Spirit. When my life on this earth is over, I pray that the legacy I leave will impact the lives of others in their walk with You. In the powerful name of Jesus I pray. Amen! I'll see you back here on Friday for my final Blogging Through the Bible post on Exodus! It's hard to believe we are almost finished...I'm kind of sad...lol! But don't worry, on Monday we will start reading in the book of Matthew - I can't wait! See you Friday! 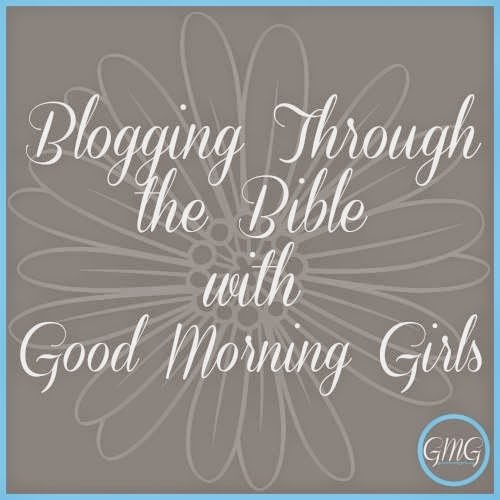 I'm linking up with Courtney Joseph over at Women Living Well, home of Good Morning girls for Blogging Through the Bible! Click on the image below to read Courtney's post today and posts from others who are BTTB too!